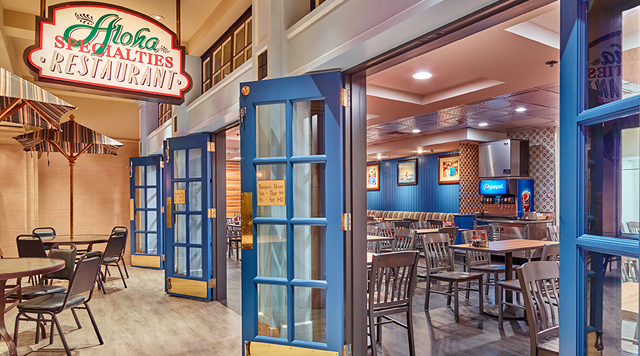 Aloha Specialties, located on the California Hotel & Casino's mezzanine, will satisfy your taste buds with its Island fare. With the umbrellas and wicker chairs lining the mezzanine outside the restaurant, Aloha Specialties transports its diners, at least for a short moment, to the islands. Step inside and its walls are lined with native art and the tables and chairs are covered with the "aloha" prints that you'd see in Hawaii. Aloha Specialties features teriyaki plates, stews and curry specialties, combination plates and noodle dishes such as Chicken Tou Saimin and of course, the popular "rice bowls". Eating in or taking out, give yourself a treat and try Aloha Specialties.